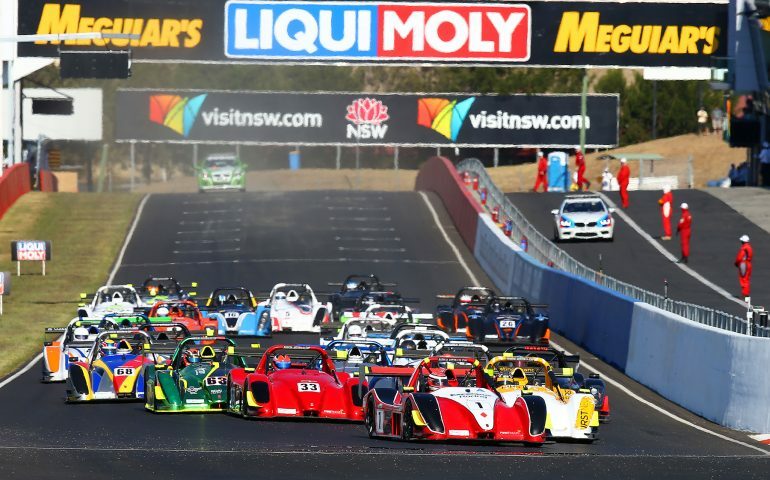 As it has across the last three seasons, the opening event of the 2017 Radical Australia Cup will be contested on one of the toughest stages in world motorsport – Bathurst’s iconic Mount Panorama. With the mighty Radical SR3 beneath them – powered by a 260bhp Hyabusa 4-cylinder powerplant pushing the cars to lap-times that rival some of the quickest GT3 cars in the world – the Radical Australia Cup [RAC] drivers will experience the thrill of circulating Mount Panorama at a pace usually reserved for Australian motorsport’s elite. Currently the Radical SR3 lap record around Bathurst is held by two-time RAC champion Peter Paddon, the First Focus SR3RS pilot circulating the 6.213-kilometre Mount Panorama circuit in a 2:12.2670 during the second race of last year’s opening round. By contrast 6-time Supercars champion Jamie Whincup set the fastest lap for the annual Bathurst 1000 last year at 2:06.4325..! Paddon will return to Bathurst this year as arguably the man to beat, the Sydney-sider having won every SR3 Radical event at Bathurst over the last two years on his way to back-to-back titles, but whilst he says he enjoys the pressure of being ‘the hunted’, he admits too that season 2017 could be a very different ball game. “There’s a couple of the latest-spec 2017 SR3 RSX cars coming for Bathurst, and they’ll carry a little more power than the 2016 RSX cars and that could make a big difference up the hill and down Conrod Straight,” Paddon admitted. Sydney’s Kim Burke too will be amongst the front runners – a title contender across the last three seasons, Burke was terribly unlucky at Bathurst last year after being taken out on the final corner of the second race whilst locked in a battle for second. He is regularly amongst the podium placegetters, and with past experience at Bathurst and mounted behind the wheel of the new 2017 SR3SX which features more aero and more power than it’s predecessors, Burke could well be the greatest threat to Paddon three-peating at Mount Panorama. Whilst Paddon and Burke have plenty of prior Bathurst experience to draw on, one man who will be making his RAC competition debut at Mount Panorama, has mixed feelings about the season opener; 2016 Rookie of the Year, Simon Meade. Fortunately for the Strategy One Human Resources driver, entry into the Challenge Bathurst event in late 2016 gave the Victorian valuable laps behind the wheel of his SR3 on the mountain, something he feels will give him a great stepping stone heading into the first round of the season. “There’s no question it’s a daunting circuit, and the first few laps were a bit disconcerting but after a handful of sessions I started to get a bit of a feel for it,” he reflected. “I think it’s one of those circuits where you continue to learn with every lap. For the man who placed third in the 2016 RAC – Vantage Freight Services David Crampton, the Victorian is looking to start his season on a high note, despite enduring some tough runs at Bathurst in past years..
With more than 40,000 people attending the 12-Hour event last year, and almost a quarter of a million people watching the live-streaming online across the weekend, the eyes of the fans will very definitely be focused on Bathurst and all the track action, providing significant value to the RAC competitors. 25-drivers have entered the opening round of the season, with a good mix of seasoned veterans, impressive new stars, and rookies making up the Radical Australia Cup field. The teams will get their first chance to circulate Mount Panorama in anger on Friday, 5 February, with a single 35-minute practice session at 10:00am, before qualifying at 2:30pm – a single 20-minute session that will set the grid for both races. Two 15-lap races are scheduled across Saturday, the first of which will come in the cooler conditions at 9:10am, before the second race at 4:35pm.